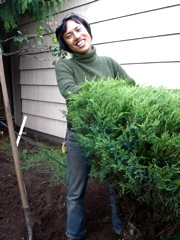 I provide quality organic care for northwest gardens specializing in perennials and edibles. I am dedicated to providing friendly service from weeding to watering and planning to planting. I am crazy about plants and will give your garden the same attention that I do at home. My goal is to ensure your garden is healthy and happy. I work year round, and am available five days a week - at an hourly or a fixed rate per project. Please call and schedule an appointment any time Monday through Friday. I look forward to working with you.